In a letter filed last week and unsealed Tuesday, Apple told a New York judge that the federal government had asserted the All Writs Act —the 18th-century law at the center of Apple's fight with the FBI —in at least nine pending court cases beyond the San Bernardino, Calif., shooting. The requests were filed between October of 2015 and this month in several jurisdictions: three in New York, three in Illinois, two in California, and one in Massachusetts. 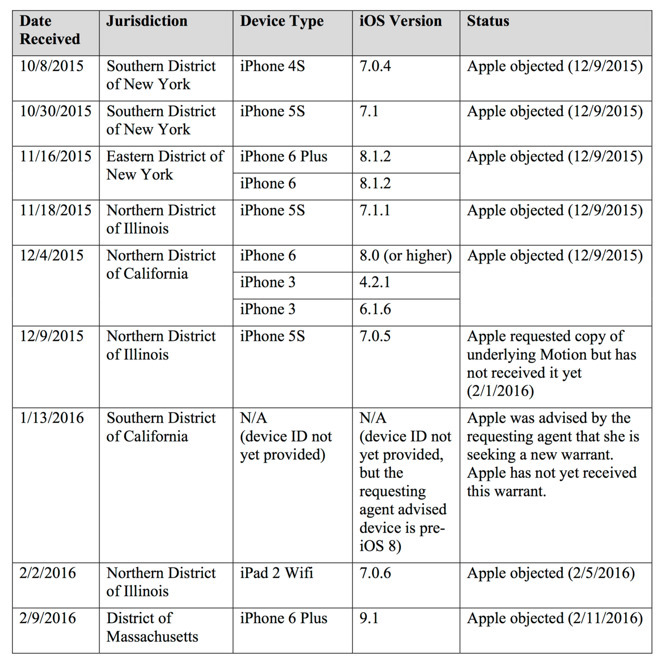 Apple objected in seven cases, with two still pending. Written by attorney Marc Zwillinger, the letter was submitted as part of a drug case being litigated in New York. Apple is attempting to have the judge in that case —in which the defendant has already pled guilty —rule on whether the All Writs Act can be used to force Apple to decrypt currently-encrypted devices. "The question of whether the All Writs Act can properly compel a third party like Apple to assist law enforcement in its investigative efforts by bypassing the security mechanisms on its device has been fully briefed and argued," Apple wrote in an earlier letter to the judge. "The Court is thus already in a position to render a decision on that question." That the All Writs Act has been asserted in other cases seems to weaken the FBI's argument in the San Bernardino case, while supporting Apple's view that the bureau is working to set a dangerous legal precedent. "The attached order [from the San Bernardino case] directs Apple to perform even more burdensome and involved engineering than that sought in the case currently before this Court - i.e., to create and load Apple-signed software onto the subject iPhone device to circumvent the security and anti-tampering features of the device in order to enable the government to hack the passcode to obtain access to the protected data contained therein," Zwillinger wrote in the most recent letter. "As invited by the California court's order, Apple intends to promptly seek relief. But, as this recent case makes apparent, the issue remains quite pressing." "Look, I used to run the NSA, OK?" Hayden told USA TODAY. "Back doors are good. Please, please, Lord, put back doors in, because I and a whole bunch of other talented security services around the world —even though that back door was not intended for me —that back door will make it easier for me to do what I want to do, which is to penetrate."